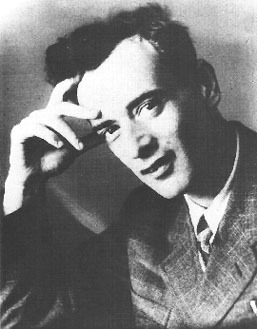 Soviet scientist Lev Landau won the Nobel Prize for Physics in 1962 for his work on superfluidity, the frictionless flow of liquid at temperatures near absolute zero. Though he was a child prodigy in mathematics his academic progress was haphazard, due to the disarray in Soviet education system following the Russian revolution. He never graduated high school but entered college at the age of 13. He was 17 when his first scientific paper was published, but he never wrote a doctoral thesis — the Soviet Union had briefly abolished academic degrees. He was granted a doctorate at the Ukrainian Physico-Technical Institute in 1934 on the basis of his scientific accomplishments and renown, as he was promoted to full professor. Students and colleagues called him "Dau" from the last syllable of his surname. He conducted research into the density matrix method in quantum mechanics, the dynamics of ferromagnets, the intermediate state of superconductors, the quantum theory of diamagnetism, the renormalization of electron charge in quantum electrodynamics, second-order phase transitions, the statistical theory of nuclei, superconductivity, the theory of Fermi Liquid, and the two-component theory of neutrinos. He is considered a founder of the quantum theory of condensed matter, and his work had a substantial impact on astrophysics, condensed-matter theory, nuclear physics, particle physics, quantum electrodynamics, statistical physics, thermodynamics, and other branches of 20th century physics. With his friend and colleague Evgeny Lifshitz, he wrote a ten-volume text in advanced physics which was used in Soviet scientific education for decades. As of 2008 his four most widely-read papers had been cited in almost 200,000 subsequent studies. Landau was an iconoclastic man — he tended to wear checkered shirts to formal events, his marriage was open, and he never joined the Communist Party. He was willing to look at all sides of every problem, a characteristic that caused nearly cost him his life when, in April 1938, he was observed accepting and discussing an anti-Stalinist pamphlet on the street. He was immediately arrested and imprisoned for over a year as a suspected spy for Germany, a highly unlikely accusation as Landau's family was Jewish. He was released from prison only after Pyotr Kapitsa, his supervisor at the Institute of Physical Problems in Moscow, wrote to Soviet Premier Vyacheslav Molotov, pleading that Landau's presence was vital to Kapitsa's work. Emaciated and with hair turned gray at 31 years of age, Landau said later that he believed he had but weeks to live before his release order was received. He considered himself a socialist, but abhorred Josef Stalin for what Landau considered his "betrayal of the socialist ideal", and he wrote that the Soviet Union of the 1930s and '40s was more fascist than socialist. He did some slight work on the USSR's atomic weapons program, but only, he said discreetly, the minimum necessary for his own personal safety. After Stalin's death in 1953 he declined all classified work. In 1962, the same year he won the Nobel Prize, Landau was traveling in a car that was involved in a head-on collision with a truck. He suffered eleven broken bones, a fractured skull, and a month and a half in a coma. Doctors were able to save his life but he never fully recovered, never resumed his scientific work, and he died six years later from complications related to the accident.